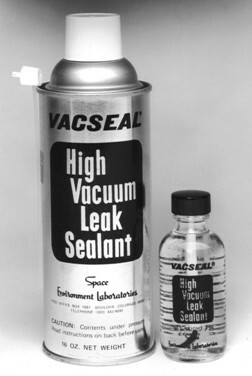 VACSEAL, HIGH VACUUM LEAK SEALANT is primarily for use in sealing leaks up to 2 micron liter per second in high and ultra-high vacuum systems, while the system is in operation. VACSEAL will seal leaks as large as 4 micron liters per second on systems under evacuation. The sealant will repair larger leaks if the system is at atmospheric pressure. The vapor pressure of the sealant is highest when initially sprayed or painted on the system. The vapor pressure can be reduced to nearly that of most metals by simply curing with a modest amount of heat. VACSEAL is extremely useful as a cement for sealing all kinds of optical windows and CRT glass to wire feedthroughs. It will substantially reduce the IR reflectivity of metals and will produce higher emissivity levels for better heat transfer. VACSEAL has expansive application as an adhesive at cryogenic temperatures as well as good radiation resistance. The sealant’s durability will survive the environment of space without adverse effect on the product or the spacecraft itself. VACSEAL can withstand repeated temperature cycling from liquid helium temperatures to 450 C over long intervals of time. Available in both aerosol cans and bottles. Distributed worldwide by SPI Supplies.